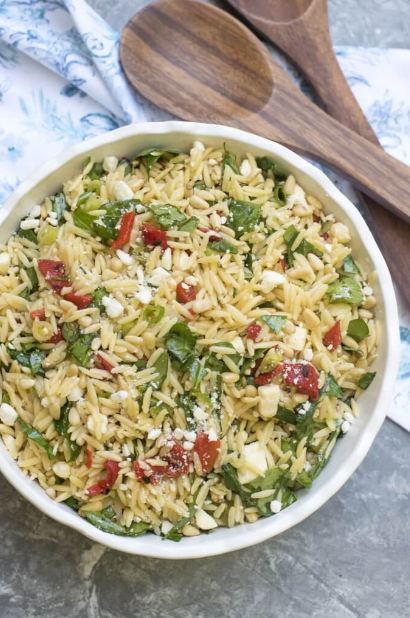 This Orzo Salad with Roasted Red Peppers, Spinach, and Feta is a light, fresh dish that is a delicious choice for a summer BBQ menu. Whisk together the olive oil, vinegar, lemon juice, and honey. Season to taste with a bit of salt and pepper. Set aside. Bring broth to a boil in a good sized saucepan or pasta pot. Add orzo and cook until tender according to package directions. Drain well in a fine mesh colander but do not rinse. Transfer to a large mixing bowl and toss with 1 or 2 teaspoons of the prepared dressing to prevent it from sticking. Let the pasta cool to room temperature. If making in advance, cover and refrigerate cooled orzo until ready to assemble salad. Toss the cooled pasta with the roasted red peppers, spinach, basil, and green onions. Pour the vinaigrette over the salad and stir to coat the ingredients with the dressing. Season with salt and pepper, if desired. Sprinkle the feta and pine nuts over the top and toss lightly. Serve at room temperature.